The folks of Chattanooga, Ohio, have always been a close-knit community with a knack for making the best of the times. Even during the Great Depression. They worked hard in the little village but they also knew how to have a good time. And they enjoyed kidding around with each other. Some of this good-natured kidding was in the “Chattanooga” section of the weekly local newspaper, The Willshire Herald, back in the 1930s. Perhaps it was because the country was in the midst of the Great Depression that the residents looked to the fun newspaper items as a diversion. Individuals [or probably one person in particular] wrote Dear Santa letters in 1933 and they were published in the Christmas edition of The Willshire Herald. 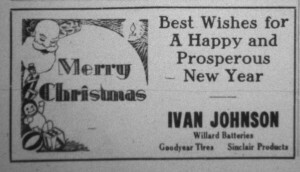 The Willshire Herald, Christmas 1933. These Dear Santa letters are not what you might expect. They were not written by the children of Chatt, but were written by the adult Chattanoogians. These were probably based on funny incidents that we will never know about. So read about some good old-fashioned Chattanooga fun at Christmas time. Many of you will recognize some of the names. Dear Santa: I have been a very good little girl and I would like some nice curls to pin in my hair, a toy piano, some oranges and grapefruits. Orville would like a red wagon and a story book about “The Tree Bears.” Your little girl, Ruth Hoblet. Dear Santa Claus: Guess you didn’t receive the letter I sent you last year so I’m asking you again, dear Santa, please! Bring me a new car. I feed the cow and chickens every day and have been making buckwheat cakes for Carl’s breakfast since the first cold day we had last fall. If you still think I am asking too much just leave a stick of dynamite and a match and I’ll take care of the rest. Your little girl, Marcella Schroeder. Dear Santa: I would like a story about “When Man Was Boss.” If you do not have a book of such an early edition then send me the popular book of the day, “Woman, the Queen over the Land, Air and Water.” Bud Smith. Dear Santa: Please bring me a compass so I can always find my way home. Fred Wick. Dear Santa: We are two little boys just out of school and would like to correspond with lady friends about seventeen years old. Our dad lets us drive the family cars now and then so we could go to a few movies. Your choice will suit us OK, Santa. Your little friends, Glenn Schaadt and Reginald Fisher. P.S. Did you help Luther Egger and Warren Weisenborn find their lady friends? Dear Santa: I would like a violin that can be played by just turning a crank. I promise never to play the same tune twice if I have to buy a hundred records a year. You may also bring me a Jersey cow. Your little boy, Ivan Johnson. P.S. I haven’t told a lie this year. Ivan Johnson Garage, Chattanooga, The Willshire Herald, Christmas 1933. Dear Santa: Please send me a brand new beau, a string of beads and a ring. With love, Margy Wendel. Dear Santa: I would like a tall and broad-shouldered farmer boy, if you please. Berniece Bollenbacher. My Dear Santa: I want another bottle of dog medicine (Floyd drank the last I bought), some more Michigan potatoes, another permanent and some oranges. Your own little Hazel Vining. Please Dear Santa: Bring me a License of Leisure of the year 1934. Hod Becher. Dear Santa: I would like to trade wives for one of small stature and less power. Your little boy, Andy Myer. My Dear Santa: I would like a baseball mask and a chest protector. Your little friend, Lewis Wendel. Dear Santa Claus: I never argue with my husband and always cook his favorite dishes so won’t you please bring me a new coat, a new hat, (I made a beautiful black dress out of some material I found in the rag bag so you don’t need to bring a dress). If you have plenty of jewelry please leave me four strings of beads with earrings to match. Dot Smith. Marcella Schroeder was my second grade teacher at Willshire School and I have heard that she wrote the fun Chatt items for the paper. If so, she probably wrote these Dear Santa letters, too. The Willshire Herald, Willshire, Ohio, 22 December 1933, p. 8. Mrs. Schroeder had such a stern appearance and behavior as our teacher, so it is very hard to imagine that she had a sense of humor. Waldo, you are right on. Even for some who have a sense of humor it really does not show. Although I never had Mrs. Schroeder as a teacher, I always thought that she was a very caring, disciplined, conscientous, and devote person. For her sake, I hope she had a sense of humor even thought it may not have not been noticeable by others. Speaking for myself, I’ve been told by some that I need to work on my sense of humor. So Waldo, in that regard, I do appreciate your comment. It is well taken. Thanks. Mrs. Schroeder was my second grade teacher, too. She was also my favorite teacher in all my school years, including college. I can’t say that I remember a sense of humor, but she was an excellent teacher and I remember her motivating and encouraging me. Maybe she was nicer to me because we both went to Zion church and she knew my family — or not!!!! Guess you could say the same for so many of our teachers at Willshire. Mrs. Bain, Mrs. Bowen and Mr. Sipe all came across as stern, mean and all business, but were actually golden with soft hearts for anyone who really looked. Then there was Mrs. Clouse and Mrs. Fisher who were gentle, kind and easy going even on the surface, and the goodness ran deep as well. We were blessed with some fantastic teachers. And Mrs. Freeman was funny, happy and excited to be teaching. Most spent their whole lives doing the same grade at the same school for the same families. What dedication and determination! They had no ambition to advance or seek their own glory, fame or even better pay, they just wanted to teach and guide children. We certainly undervalued their gift, at least back then. Though I must admit that my folks held them all in high esteem as dedicated teachers who were making real sacrifices for us and always due proper respect. We both had the same teachers at Willshire, but as you mentioned, they taught there for many years. I agree that most of them were rather stern and wouldn’t put up with much horsing around. I got along with all of them but Mrs. Fisher and Mrs. Bain were probably my favorites. I also liked Mrs. Freeman and she was much younger than the others. None of them really seemed to have much of a sense of humor. I guess that I why I also wonder if Mrs. Schroeder did write those silly tidbits for the paper. But she may have had more of a sense of humor around adults than she did around her second graders. Plus, she would have been over 25 years older when I had her for a teacher, if she was writing the stories in 1933. Maybe someone else knows who wrote those stories for the Willshire Herald. rently because I perceive Mrs. Schroeder different than you. I had her for my 1st & 3rd grades (split classes as these were large classes) and she was wonderful. She drew beautiful colored chalk pictures on the blackboard and I remember them as being wonderful works of art. She was kind and warm to all of us, not like Mrs Clouse who paddled Sylvia Wilson for not knowing her spelling words. Awful!! With many sisters & brothers, the word about good/bad teachers got around. Mrs. Bain was grouchy, Mrs. Bowen played favorites. and Mr. Sipe was very mean and physical especially to the boys. Pushed them around and if he did any of that now, he’d be in jail!! He was said to feel girl’s backs to see if they were wearing a bra!! Never touched me but we were scared of him. Ugh. We kids had a lot of good memories that made up for the not so good ones. I do not remember Mrs. Schroeder drawing pictures. I wish I could remember that. I also remember that several teachers had nasty tempers, but I don’t think Mrs. Schroeder had a bad temper. Classes were pretty large back then and it probably was stressful trying to teach all those kids. I also remember some kids getting paddled, but it was usually one of the boys that was punished in my class. I never had Mr. Sipe as a teacher. He may have been principal when I was in school, but I know most everyone feared him. Was fun to read this, especially what Uncle Floyd and Aunt Hazel Carr Vinings wrote. N\My grandma Black was Carr, not sure if you remember. We went to Buckley Michigan to see them after they moved from Chatt. Have a good week. What a great discussion! Something magical about how others remember these people and times. Mrs. Fisher was indeed tops of the teacher list at Willshire. Mr. Sipe was the 6th grade teacher, I think, he was really before my time, but I did run into him once or twice in the school building. He was always very nice (I was only first grade), so it was hard for me to understand why he was so feared and disliked. I suspect he had to be the disciplinarian for the boys, especially the older ones, as he was the only male teacher on hand. Note that I left out Mrs. Dellinger (3rd grade). Can’t say anything good, so I am not saying anything. The stern teachers all had my respect because it was their way of keeping order and making the system work. There were always a few who needed “attention” and they were not reluctant to provide it, which made life bearable for those who were behaving themselves without that extra “attention.” They were always just in their attention as far as I could tell. That first day of school back when I started 2nd grade was terrifying. Mrs. Fisher was going to do half the class and the other half would be with Mrs. Schroeder. We were all in a room together and list was read to be split off into Mrs. Fisher’s class. I was left in Mrs. Schroeder’s room. My heart sank. While I did not know Mrs. Schroeder, I had seen her around school and knew she never smiled and frequently growled at kids in the hall. On the other hand Mrs. Fisher was always smiling, always kind and gentle both at school and church. Fear overwhelmed me as Mrs. Schroeder began organizing students, assigning seats, etc. In just minutes Mrs. Fisher came back in the room and they did it all over again. Why? I have no idea, maybe it was the answer to my prayers. This time I was on the list to go into Mrs. Fisher’s room. Perhaps the best year of my whole school experience! I particularly liked the little experiments that she set up for us,ie seeds to sprout in the window. Never demanding, always encouraging. What a teacher!